Not sure if you are eligible for RPL? Try our 'skills assessment' document below. This qualification is designed to meet the needs of builders, including selecting contractors, overseeing the work and its quality, and liaising with clients. 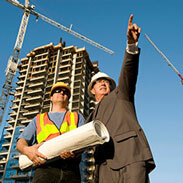 The qualification is aimed at the medium-rise building sector. It is also a requirement for a Queensland Building and Construction Commission (QBCC) Builder -Medium Rise licence. For more information on this licence, click here. The nominal duration for this program is 1720 hours. The estimated duration could be shortened to around 29 weeks if you could study for a at least 14 hours per week, however, this figure may end up much lower or higher depending on your particular circumstances. See our course brochure for more information. To successfully complete this qualification, you are required to complete eighteen (18) units of competency. The eighteen units comprise thirteen (13) core units and five (5) elective units. The units of competence shown in units/cost have been selected by PCD Training based on the course purpose. A participant has a six (6) month enrolment period per unit/s from time of enrolment. 1. The Estimated Duration is calculated on your studying for at least 10 hours per week in that unit. The Total is calculated on a continuous study pattern of one unit at a time. You could reduce the total duration by enrolling in more than one unit and/or increasing your study time each week. You will need to apply for entry into this course, this is done by completing the skills assessment document found at the end of our brochure. Having completed a CPC40110 Certificate IV in Building (Building) is preferred. However, you will need a sound working knowledge of basic maths, e.g. addition, subtraction, division and multiplication and be able to read, write and understand standard English, similar to what is used in this information. You must also be able to send and receive emails with attachments and install software. You will also be required to upload files and photos and complete an electronic logbook. You may also need to download files using a web browser. You will also need access to a computer which has, or on which you are able to install, a web-cam. All personal information is collected for the purposes of enrolment requirements only. Specified information from the enrolment is required by federal legislation to be reported to the national VET regulator for statistical purposes only. Your information won't be shared with any other party. All payment information, including card and cardholder information, is collected for the purposes of enrolment requirements only. Your payment information will not be retained and will not be shared with any other party. Participants will be required to complete a range of assessments, including practicals, activities, projects, the completion of a logbook, etc. Assessment requirements are outlined in the relevant unit. Recognition of Prior Learning (RPL) is also available.